Plasma physicists and engineers at a nuclear fusion facility in the US have devised a method for achieving greater control over the behaviour of plasma as it heats up inside a magnetic-confinement fusion device. Utilising one of the most important methods for heating plasma, the method promises to help prevent damage to the interior surfaces of the reactor, while also keeping a tighter control of the amount of energy injected into the system. The team, which works on the DIII-D tokomak at General Atomics in San Diego, has been tackling difficulties with the device’s neutral beam injection system. A tokomak is a toroidal (doughnut-shaped) vacuum vessel surrounded by electromagnets that keep the charged hydrogen plasma confined away from its walls while it is heated and accelerated around the torus to encourage its constituent particles to undergo nuclear fusion, releasing energy. 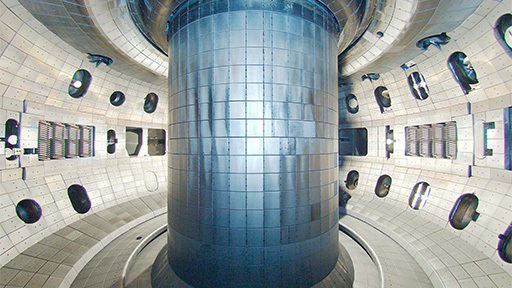 These neutral beams are an important component of the fusion system, as they heat the plasma in two ways: by injecting uncharged particles into the plasma at high speed, they transfer energy to the plasma particles by collisions, and also add momentum and torque to the spinning plasma. By contrast, the other two heating methods used in magnetic confinement fusion devices each only add energy in one way: radio-frequency injection works in exactly the same way as a microwave oven, and driving the plasma current by manipulating the magnetic fields that surround and confine the plasma only adds momentum. Neutral field injection works by accelerating positively-charged ions through an intense (90,000V) electric field and sending them into a chamber of dense gas, where they pick up electrons and lose their positive charge. The acceleration field gives them so much momentum that they fly through the neutralising gas and straight into the tokamak. However, in the past this has caused problems. Injecting these fast particles into the plasma can cause or amplify electromagnetic waves that kick the particles straight out of the plasma and into the tokamak walls, causing damage to the wall surface and losing the energy that the particle was supposed to transfer to the plasma. This was a major undertaking, in part because of the sheer size of the neutral beam injection equipment. 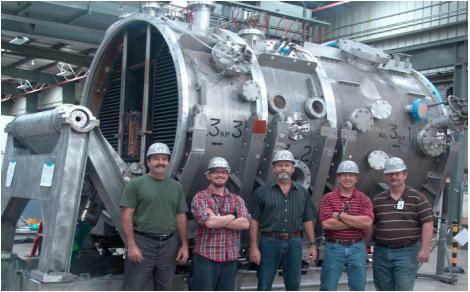 DIII-D is a relatively small tokomak, 1.67m in diameter, but its eight neutral beam injectors are housed within four truck-sized units. The team is presenting its results at a meeting of the plasma physics division of the American Physical Society. Does that make usable fusion power now 19.999 years away rather that the standard 20 years!